The thing to observe is everybody has crossed the impediments of the vices, one by one, by His grace. This means each and every person can cross all the vices slowly if one cultivates steadfastness and bhakti with a calm and composed mind that enables one to respond to any given situation, that does not react. With bhakti and love of God or Guru, one can easily transcend these vices. One should have shradDhA, and steadfastness with patience. you are the one with the form, you are also one without a form. you are present in the smallest, in the flower, in the ring of the bell, and in the Light. You are the embryo, you are the life, you are the destiny, and you are the fate. Please come upon us as our Guru and bestow your blessings. This is the last verse of Kandar Anubhuti. on the day to day expenses, and also to marry way his daughter. Mahaperiyava asked: Do you chant any swami slokas? 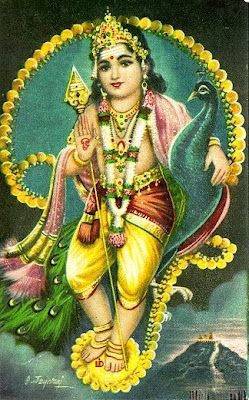 He said: I am chanting Kandhar Anubhuti every day apart from sandhya vandanam on the three occasions on any day. income also, he will give enough income to you in due course. Do not worry. Keep chanting Kandhar Anubhuti. ". GuruvAi, varuvAi aruLvAi guhane! varuvAi means income also, he will give enough income to you in due course. Do not worry. Keep chanting Kandhar Anubhuti"
Truly typical of Kanchi Mahaperiyava!He pulls off these things from nowhere! The Devotee has now got the 'Varuvai' from 'Guru Vai'-How can the words of the Guru ever go amiss.I am sure it would have borne fruit. Tamizh is such a wonderful language ,so expressive and succinct.People think that there are not enough alphabets to support it phonetically but the richness of this ancient language is elsewhere! Tamizh is the language of heart . The saint poet says: O my Master, give me devotion to pray to your two golden feet and and attain them. The devotees who are with ardent love for you, have reached your Abode already. I am merely standing outside. some thing for my sake). These oor A and kuruttu A, are a rare simile / metaphor which I have not seen elsewhere. தமிழ் இன்பத் தமிழ் எங்கள் உயிருக்கு நேர். தமிழ் எங்கள் சமூகத்தின் விளைவுக்கு நீர்.! தமிழ் எங்கள் வாழ்வுக்கு நிருமித்த ஊர்.! தமிழ் எங்கள் உரிமைச்செம் பயிருக்கு வேர் ! தமிழ் நல்ல புகழ்மிக்க புலவர்க்கு வேல். தமிழ் எங்கள் அசதிக்குச் சுடர்தந்த தேன். தமிழ் எங்கள் கவிதைக்கு வயிரத்தின் வாள. Tamil. is extolled as per with our lives ! Tamil is the root of all our liberty"
Tamil for the scholars, is a powerful arrow ! Tamil is an invigorating honey sweet ! Tamil, to our verses, is a diamond sword ! Tamil is a powerful and enthusing flame ! and said: Oye, Kanaka Subburatnam, you are really a poet!. Ratnam also changed his name as Bharati Dasan. active politician nor a glorious poet. His stars did not rise further. Wonderful poem of Bharatidasan;I had intended posting it the moment I saw Krishna's comment.Bharatidasan's devotion to his Guru Mahakavi Bharati is something that lasted throughout his life.Bharatidasan was a wonderful person,very upright,downright honest,uncompromising in not pandering to anything selfish.Truly a noble soul despite his joining the Dravidian movement.Once it so happened that when he along with other DK enthusiasts were going along a road when he came across chellamAL bharati(wife of the Mahakavi)unexpectedly.He immediately went and greeted her and prostrated full length in that open road.When the other 'Rationalists' questioned him on this,he said-'This is my Iyer's consort'.He never used to call the Mahakavi by name and used to address him as 'Iyer'(Head,Chief).There was this other instance when AnDAL's TiruppAvai used to be played through the Loudspeakers in a nearby temple,near Bharatidasan's home,early in the morning during the month of mArgazhi.Someone lodged a police complaint that the playing is disturbing the Neighbourhood and their early morning sleep!Police approached the Temple Trusties and asked them to play it at low volume.News travelled apace that someone had lodged a complaint with the Police regarding the playback through loudspeakers of TiruppAvai.As usual rumours spread that it must be Bharatidasan ,since he belonged to the Atheist DK group and his home is in the immediate neighbourhood.This was conveyed to Bharatidasan who lost no time in organizing a public meeting that very evening.A huge crowd gathered and Bharatidasan announced that he had organized this meeting to clear the false Ground that he had lodged a police complaint.He said ,is a devotee of AndAL's sangath Tamizh maaLai of tiruppAvai and gets up early in the morning just to listen to the Broadcast and not miss it! He added 'I Go to sleep again only after listening to it'!If someone who doubts this,he may come forward....That was the end of that rumour. Nice information about Bharati Dasan. Thanks. Excellent write up about Pavendar Bharatidasan . Here is an excellent song by Pavendar Bharati Dasan Sangae Muzhangu for Tamil. சங்கே முழங்கு , சங்கே முழங்கு , சங்கே முழங்கு எங்கள் வாழ்வும் எங்கள் வளமும் மங்காத தமிழென்று சங்கே முழங்கு சங்கே முழங்கு! எங்கள் வாழ்வும் எங்கள் வளமும் மங்காத தமிழென்று சங்கே முழங்கு. எங்கள் பகைவர் எங்கோ மறைந்தார் இங்குள்ள தமிழர்கள் ஒன்றாதல் கண்டே! பொங்கும் தமிழர்க் கின்னல் விளைத்தால், பொங்கும் தமிழர்க் கின்னல் விளைத்தால் சங்காரம் நிஜமெனச் சங்கே முழங்கு! வெங்கொடுமைச் சாக்காட்டில் விளையாடும் தோளெங்கள் வெற்றித் தோள்கள். கங்கையைப்போல் காவிரிபோல் கருத்துக்கள் ஊறுமுள்ளம் எங்கள் உள்ளம்! வெங்குருதி தனிற்கமழ்ந்து வீரஞ்செய்கின்ற தமிழ் எங்கள் மூச்சாம்! தமிழ் எங்கள் மூச்சாம்! Nice poem by Bharati Dasan. One can see the 'tone' of Subrahmanya Bharati here. Governement. Of course, they have named one university as Bharati Dasan University. Bharatidasan was a wonderful person,very upright,downright honest,uncompromising in not pandering to anything selfish.Truly a noble soul despite his joining the Dravidian movement. Unfortunately to the extent to which Subramania Bharathiar songs are popular Pavendar Bharatidasan's songs have not been made popular and it is just confined to DMK,DK ,Rationalist and Atheistic circles in TN and Pondicherry . Might be because he expounded the cause of Tamil Nationalism and Atheism a lot than talking about God and a United India which Subramanya Bratahi did . But he has sung about Parasakhthi starting with "Engengun Kaanum Sakthi..."
I and unable to get the lyrics of the same .If someone has it kindly share the same . The above film song "Sangae Muzhangu.." by Pavendar Barathi Dasan is what I listen to it regularly .